Zalaris UK are delighted to be sponsoring the HR Special Interest Group event focused on Performance Management on 27th March 2019. Gathering users, HR and IT personnel together on 27th March this SAP User Group event is being held at SAP UK headquarters. This is the place to be for everyone that desires better business results by implementing the most effective performance management tools. As well as sponsoring the event, Zalaris will share HR insight together with SAP and an existing Performance & Goals customer, Plan International. The event answers questions and demonstrates solutions that will increase workforce performance in all types of companies, from global businesses to small businesses. Karishma Neog from Zalaris UK will provide insight in the SAP SuccessFactors Performance & Goals Management modules and give insight in how the solution contribute to efficient employee follow-up, realistic goal setting and relevant feedback. “We see how cloud solutions lead to cost-saving, utilization of workforce and value creation in the businesses we serve. Sponsoring an event like this and sharing our insight is something we are happy to do”, says Zalaris CEO, Hans-Petter Mellerud. Zalaris will demonstrate some of the newest solutions within performance management. Through the SuccessFactors HCM suite employees are enabled to capture real time progress updates with advanced mobile capabilities available for both Android and iOS. For managers and HR personnel this solution contributes to facilitate structured and meaningful one-on-one discussions, the ability to link activities to employee objectives as well as coaching for better career development. There are many success stories and the global development organization Plan International will share one of them. Their journey towards a performance management culture using SAP SuccessFactors demonstrates how managers and HR personnel can lead employees with the right data and insight. They will also share on how their Human Resource Information System (HRIS) has been an enabler to work towards a performance culture which is in alignment with Plan International’s values. Finally, Lynn Brown representing SAP will demonstrate SAP SuccessFactors Performance and Goals and Compensation so the attendees can see how these talent management solutions can help managers and HR personnel motivate employees to perform at their best. If you are a member of the UK&I SAP User Group or would like to attend as a guest of Zalaris, then please follow this link to read more and register for the event! 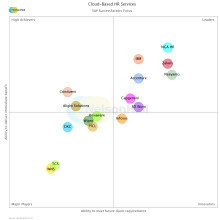 Recognition marks second consecutive year as top provider of cloud-based HR solutions and services.